Infotel Broadband Services, in which Reliance Industries Ltd has a 95 per cent stake, is looking to raise as much as Rs 1,000 crore (Rs 10 billion) through short-term commercial paper. Infotel is known to have started talks with its brokers to issue commercial paper, which can be traded in the market like bonds. Last week, RIL had raised bonds worth Rs 500 crore (Rs 5 billion), at an interest rate of 6.25 per cent. The paper that Infotel would raise may carry a higher coupon rate. A dealer with a public sector bond house said the coupon rate for this paper could be 75 to 100 basis points higher than that of RIL's paper. The prospective investors will factor in the business risk and the risk associated with a relatively new company, though backed by RIL. An e-mailed query has elicited no response from RIL. Infotel has recently won a pan-India licence and spectrum to offer broadband wireless access services in all the 22 circles in the country. The licence fee accounts for as much as Rs 12,848 crore (Rs 128.48 billion), and the deadline for this payment is June 30. 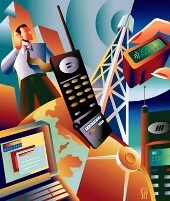 Telecom companies have been on a debt-raising spree after 3G spectrum and BWA spectrum auctions. The companies which have won such licences will have to pay the fees within the speculated time. Bankers say these companies are raising money mainly from internal accruals, commercial paper and choosing to raise short-term debt from banks as the last resort. Telecom companies are expected to replace short-term debt (six months to one-year loans), with long-term loans after they firm up their business plan on their payment. Analysts say these investments in broadband would take at least six years to break even. Regulations allow these companies to re-finance loans taken for investment in 3G and BWA, with external commercial borrowings (ECBs) as well, helping them reduce their interest rates. Last Friday, RIL bought in Infotel Broadband Services, an unlisted company for Rs 4,800 crore (Rs 48 billion). With the expanded equity base of the company, RIL owns 95 per cent stake in the company, and will become a subsidiary after the merger. The company has no other assets other than the spectrum license which it has bid for. Sources also say the company has no cash reserves. RIL, however, has cash reserves to the tune of Rs 21,874 crore or Rs 218.74 billion (as on March 31). RIL, in a presentation made to the lenders, says it intends to create end-to-end solutions in the entire data value chain i.e, content services to end-user experiences. It said it intended to service business enterprises, social organisations, educational, healthcare institutions as well as consumers. RIL said it planned to collaborate with strategic partners like service providers, infrastructure providers, application developers and device manufacturers.